Me: I hate my kitchen. It’s so dated! It needs a renovation! 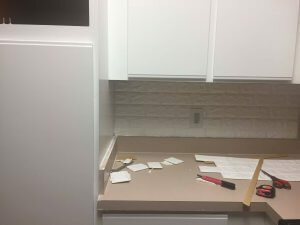 My Wallet: Do you have kitchen renovation money? 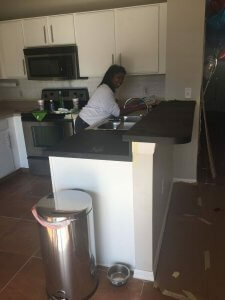 When I purchased my home, there was one room that I truly hated…. 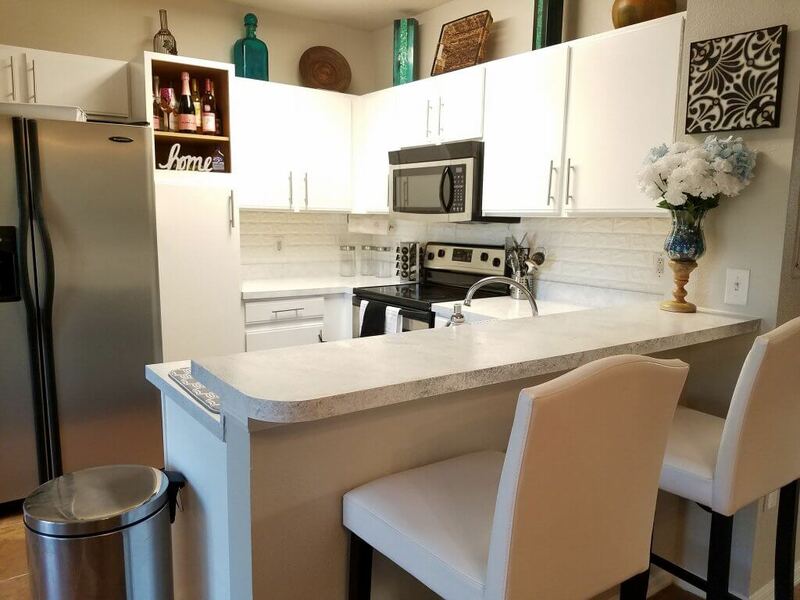 the kitchen. 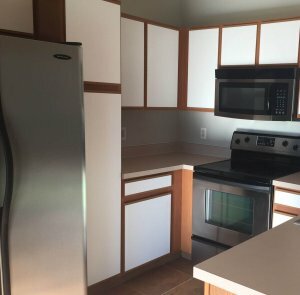 First of all, I hate two tone cabinets. They scream 2006. 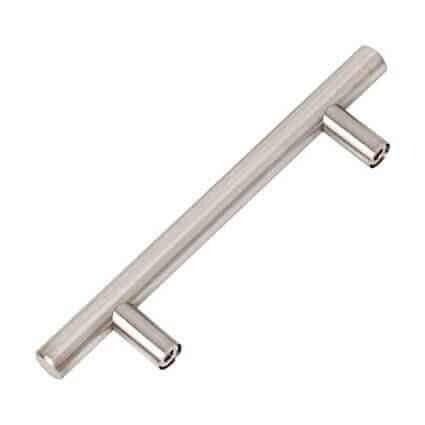 Second of all, the counter-tops and lack of glam just isnt my style! Since most of my budget went to ripping up the carpet and installing flooring, I had very little money left over for a kitchen renovation. 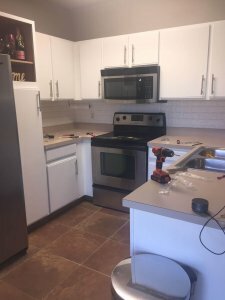 Me being the budgetnista that I am, I decided that I would do a few kitchen upgrades myself. 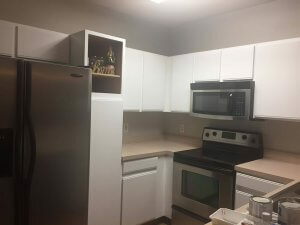 It doesnt even look like the same kitchen right?! 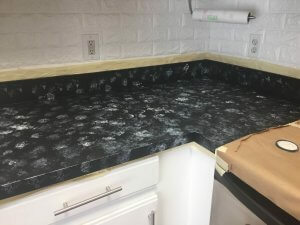 I did majority of the work myself (I had a friend help me paint the counter tops) and it took only a few days to do! 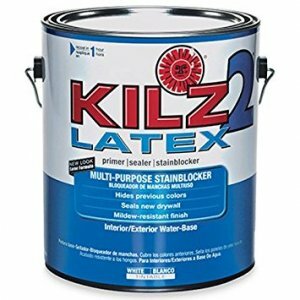 I used 2 coats of KILZ 2 Multi-Surface Stain Blocking Interior/Exterior Latex Primer/Sealer, and then 2 coats of Valspar Cabinet Enamel Semi-Gloss Latex Interior Paint . 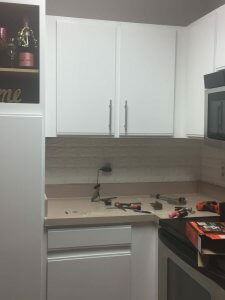 Real brick back splash would of been way to pricey and I wouldn’t of been able to do it myself. 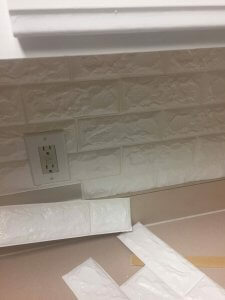 So instead I opted for this faux brick wall backsplash. It’s 3 dimensional so afar it looks really, really cool (I won’t say it looks like brick from afar but it doesnt look like a peel and stick!). I do highly recommend you have help with this because it can be tedious lining up the bricks. One thing I will say about this peel and stick is that once it sticks, IT STICKS!! 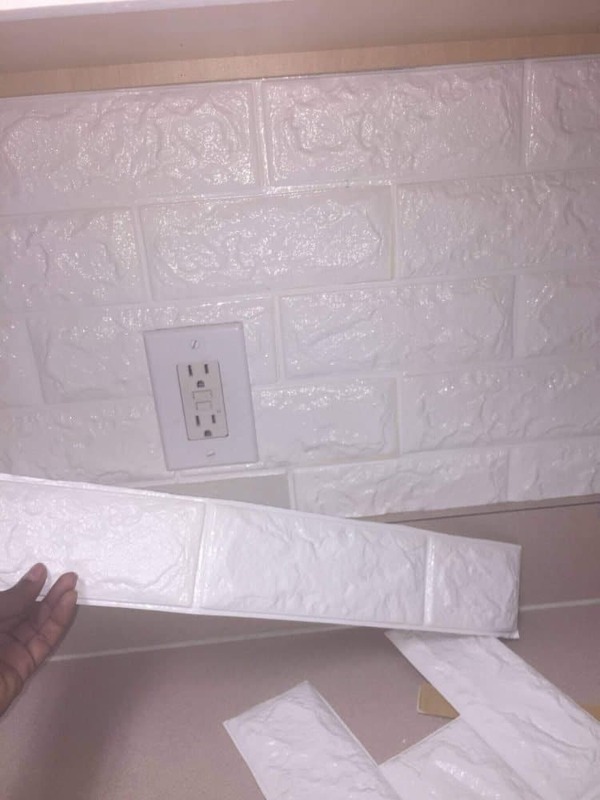 So if you mess up, you can’t restick it because the back has some heavy duty glue. I used about 6 sheets altogether. One of those sheets I had to throw away because as I mentioned before, if you align it wrong while sticking…. you can’t reuse it. The sticky part can only be applied once. Next up was the hardware! I opted for these 8″ stainless steal metal draw pulls to match my stainless steal appliances. I did have to buy new nails because the nails that came with it was too short for my bottom drawers. 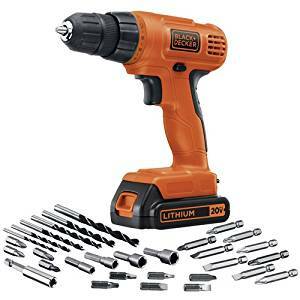 I purchased my hardware on amazon and I’m really happy I did because they were double the price at lowes and home depot! my sweet friend, Ashley, helping me paint the counter tops! 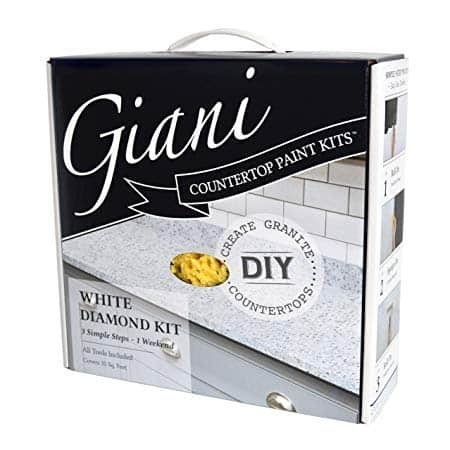 I purchased my Giani Countertop Paint Kit, White Diamond on amazon because I have prime so it was 2 day free shipping! If you don’t have amazon prime, I HIGHLY recommend you get it! I purchased majority of my stuff on amazon because their prices were cheaper plus 2 day free shipping and a great return policy! You can even try amazon prime FREE for 30 days! Just click here for the promotion. I allowed the primer the 24 hours to dry. Then I painted with the kit. The kit includes a sponge and basically you paint the different colors with the sponge. It wasn’t my favorite part lol. I went a little overboard with the paint which I regret. I wish I would of kept it darker but you live and you learn! I still love it! 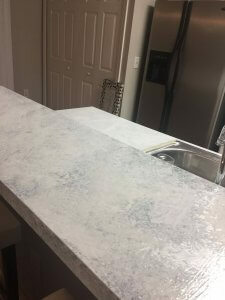 I’ve had these counter tops 30 days so far and they still look great! I’m not the handiest person in the world but I say I did a really good job! 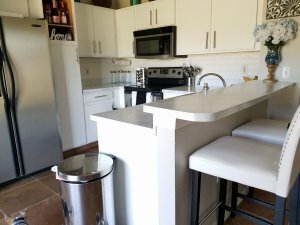 My entire kitchen renovation was under $300. 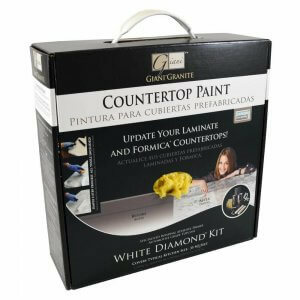 The most expensive thing being the countertop paint priced at $80. What do you guys think? 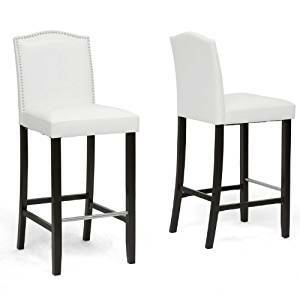 I also purchased my Baxton Studio Libra Modern Bar Stools from amazon! I love them! Love this bathroom reno? 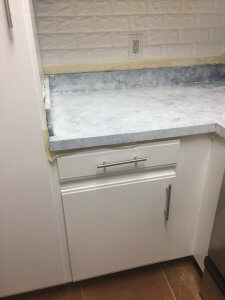 Check out my bathroom reno too! 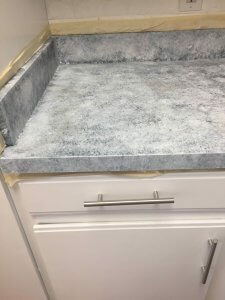 Wow your friend was right in talking you into the color of your counter tops love it. 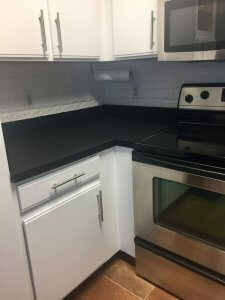 You did an awesome job on your renovations. You did such a great job! 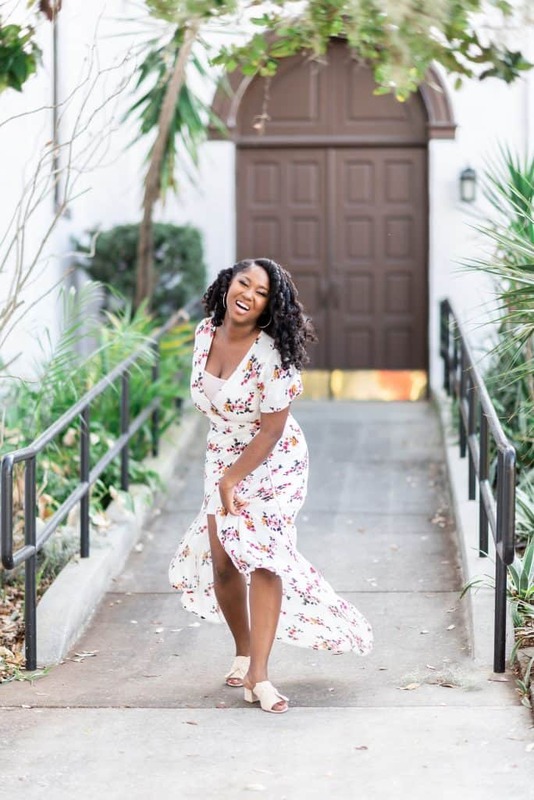 Looks like you found a little side hustle in your process lol! 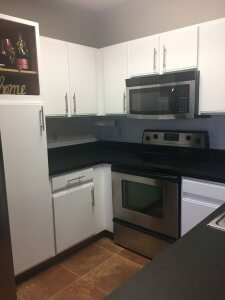 Great job on the kitchen. 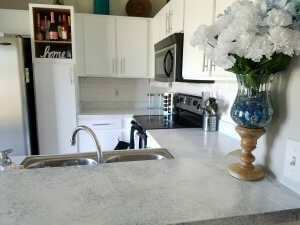 It really updates your home and looks amazing. Really nice. 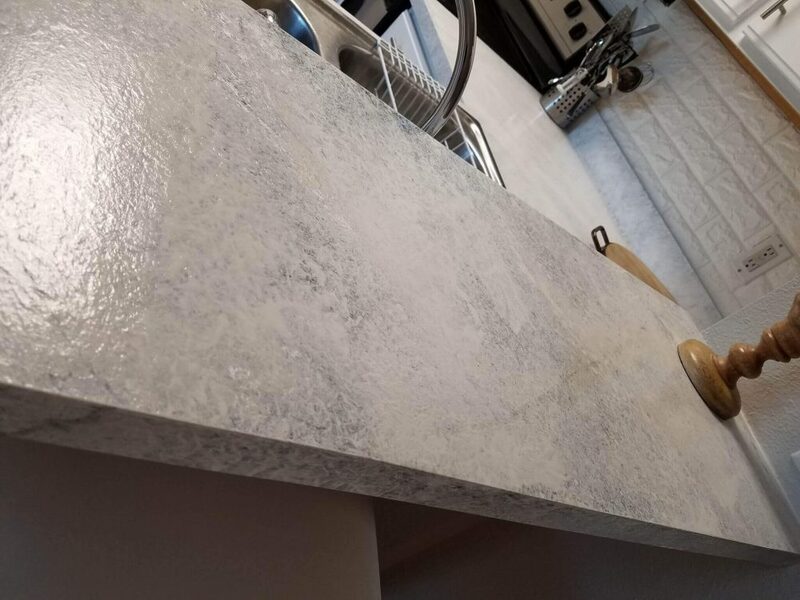 I have an ugly countertop in my bathroom. 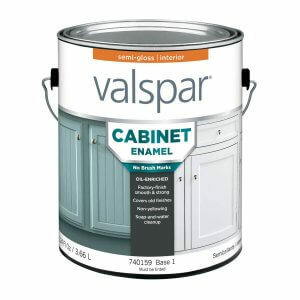 I didn’t realize they had paint for that. You’ve inspired me.